A group of venues plan to turn up the heat in downtown Scranton during October’s monthly art walk. “FIRE! 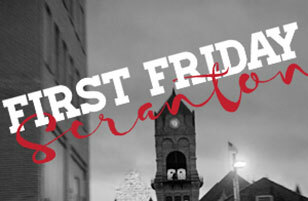 A Celebration of Art Inspired by the Element of Fire” will showcase blazing pieces across three spots collectively known as North of Mulberry, or NOMU — POSH at the Scranton Club, 404 N. Washington Ave.; Scranton Cultural Center at The Masonic Temple, 420 N. Washington Ave.; and Albright Memorial Library, 500 Vine St. The event takes place Friday, Oct. 6, in celebration of the annual Bonfire at the Iron Furnaces set for the end of the month at that historic site. “FIRE!” will feature pieces across several mediums, such as paintings, photography and mixed media. It will showcase artwork from professionals and amateurs of all ages, including pieces by artist Marty Carr. Carr has created art for 25 years and mainly paints watercolor pieces that depict the female form. 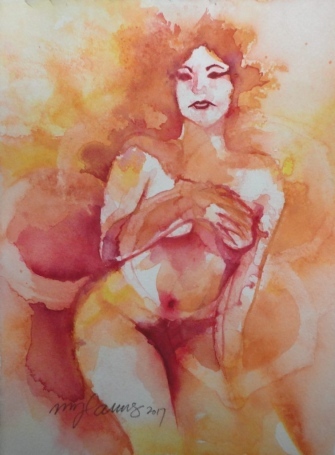 Her submission for the exhibit, titled “Burn,” depicts a woman bathed in hues of fiery red and bright orange that she said was inspired by condensation on a cocktail. “The piece has water stains on it, and it made for a cool effect on the canvas where it really looks like it’s burning,” Carr said. After taking in the exhibit, guests can immerse themselves in the theme by roasting s’mores over miniature bonfires on the sidewalk outside the venues or seeing fire-centric entertainment, including a fire-breather and fire-dancers, said Joshua Mast, co-owner and operator of POSH and the nearby Colonnade. The show is the third First Friday event presented by NOMU, which Mast said was thought up as a way to showcase what a different part of the city has to offer. Each month, a theme ties the three spaces together. Mast said the events work with what each space has to offer, such as a spoken-word event at the library. Mast suggested guests can begin their night at NOMU’s events since Lackawanna College offers free parking. Click here to read the full article on The Times-Tribune website.